Black brides have different tastes when it comes to lengths of hairstyles that turn each bride on. For this time round short hair is our priory, it doesn’t mean those pixie short hair cuts but wearing either mid length hair or long hair very short. It requires someone to either trim some sections of hair short or hold puff, or apply pins long where applicable on some sections of hair. As well you can apply weave on to your hair then hold it as bun and more options, which ever option you dream of that makes your wedding perfect. In this article I have gathered 5 Flattering wedding short hairstyles with bangs top models and celebrities have worn and for real looked great. 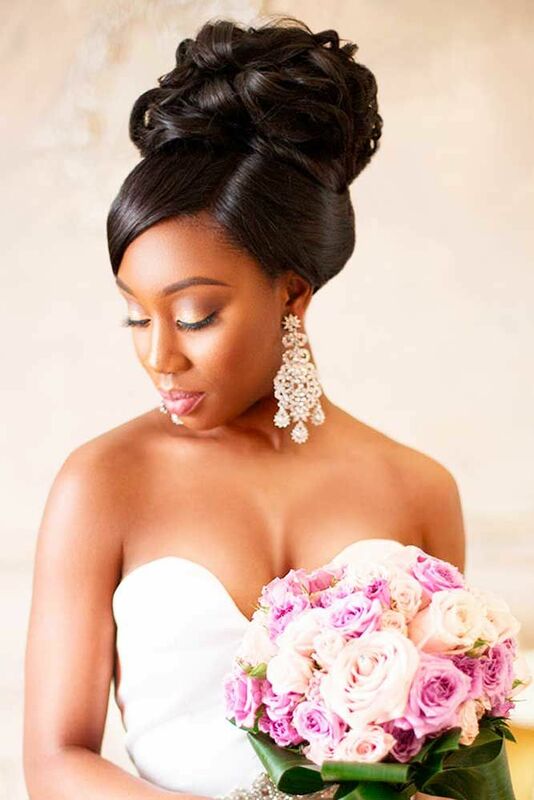 Women wear short hair on weddings on blonde, apply hair extensions on to natural hair thus keeping hair looking natural, or just play round relaxed hair as in pushing hair on straight bangs then hold the rest of hair into high bun or just apply gel on to natural hair to make hair stick to scalp then at front add short hair weave into hot bun. And many other options that you can pull on your natural hair, it’s all about being creative. This hairstyle on top is so flattering if you pick interest on it for your wedding. All your natural hair is pushed towards the crown then held into a mini puff. Your natural hair is relaxed and put together from all angles towards the crown on top you fix short colored straight weave, while at bottom you apply same piece of weave on small volume round it to hold it and to style it. At front you add small cornrow then fix piece of weave from inward facing in front to pull bangs. Let it fill entire forehead then trim it round above eyes. Use the end tail of comb to part bangs at front and in way to make hair look fashionable. Just between bangs and puff you fix your colorful tiara that hold hair from the extreme left towards the right extreme side too to look hot. And complete hair with hairspray to make hair look live, smooth and to add moisture. Determine your face Shape: The black queen wearing short blonde hair with bangs along puff has an oval face shape, if am not certain this hairstyle looks wonderful on round face shape, as well as long face shape, heart face shape, square face shape, and the rest of other face shapes you mention. Which Hair product to apply? This hairstyle constitutes on both relaxed hair and straight short weave. So on natural hair you apply TCB HAIR & SCALP CONDITIONER WITH OLIVE OIL 10 OZ, to refresh both scalp and hair. it conditions hair to keep it strong , smooth and looking healthy. Then on weave apply Organic R/S Root Stimulator Olive Oil Sheen Spray, 11.7 Ounce; to lock in moisture, make it smooth for easy combing and last to add strength. Which styling tools apply? 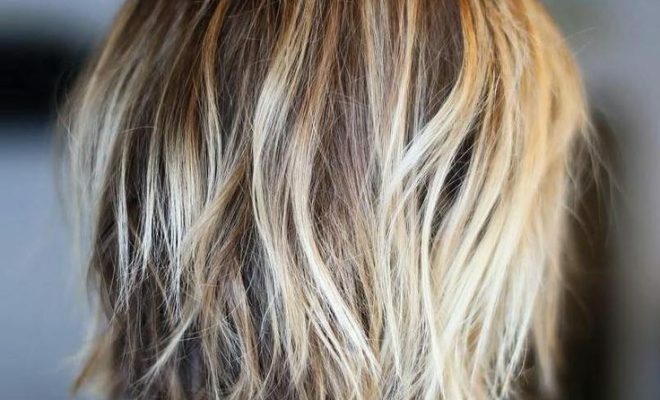 If your natural hair is already relaxed and has growth of about three weeks to a month you need to re-touch is again to put off growth for purposes of making hair look neat. When relaxing hair you put focus on growth because when you relax entire hair it make it weak and may end up breaking. After shampooing hair you add conditioner for few second then wash it off. Set hair with rollers and let it to dry. Later you push all hair straight after applying small volumes of hair product the hold it at mid crown. Pick small area at front and fix small cornrow to add straight piece to pull bangs. Use the same weave to hold puff and at bottom you fix round using the same piece of weave to make hair look colorful. You might have long natural hair and want it to have volume, it implies that you have to partly use human hair weave at back of hair then add pins on to it to make it appear short. As you check the pic the bride up front has straight hair so hair on the right side is kind of pushed straight towards side of eyes then rolled looking inwards. You create line in between then hair on the left is pushed straight towards back of ears. So at back hair is pulled with waves, let’s say volume of hair that you pull on roller is pulled straight up to tips and folded back in place kind of interlocking on small volume of waves. As you proceed towards bottom you increase the size of wave repeating the same process then fold back hair towards the scalp and apply pins. At last your hair at back will lock in tight waves that lock up with pins then at front hair is pushed bob style. Then round mid of crown you fix your colorful tiara to complete your looks. Determine your face Shape: the bride in the background is wearing a smile with short straight hair pushed on bangs on oval face shape. i want to assure you any black women out there that fall for the same hairstyle yet you have different face shape that it blends perfect with all face shapes. so what makes you to score that high is the jewelry you apply, makeup of the day , eye brow you shade , color of eye liner and lip color you apply to match with your one of the attires of the day or dress shoes. Which Hair product to apply? Use DAX HAIR FOOD PLUS4 7 OZ because it’s formulated with best natural ingredients like Panthenol, vitamins E, D3 and A to moisturize both scalp and hair, lock in sheen and give hair lasting healthy look. Which styling tools apply? Your natural hair is shampooed clean using cold water and natural extracted shampoo from avocado, eggs, Aloe Vera etc to keep the texture of your hair looking better and give hair strength. So you then add conditioner on to your hair and message it gently round hair then wash it off. 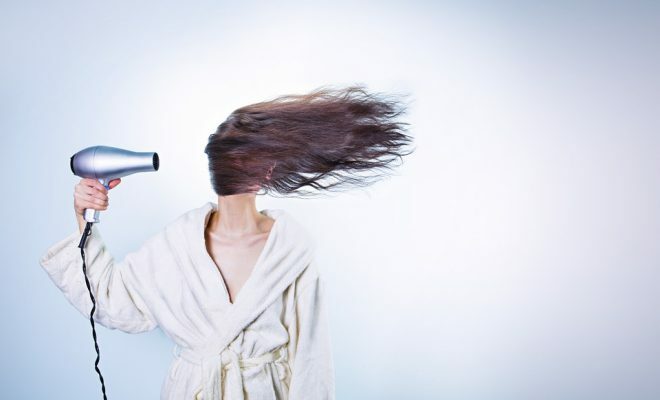 Use cotton towel to dry hair leave few waters round hair. Use big bristled comb to make hair from front towards back on then until hair is smooth. Water will start dipping, place another towel round shoulders. So apply small volumes of setting lotion round hair to make it soft then using bit toothed comb push hair backwards. 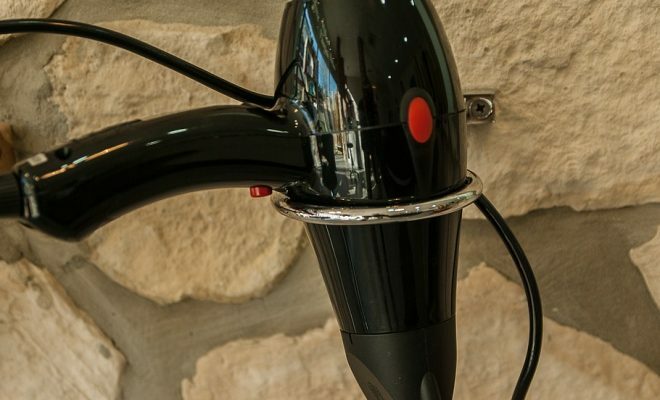 Hold all hair in the middle to avoid giving you hard time when setting hair with rollers. Begin at bottom coming forward suing end tail of small bristled comb. Apply rollers on your hair until you fill entire head. Tie soft pad round your face and ears to avoid heat then sit under drier for hair to dry. When hair is dry to make work easy, each roller you remove you add hair product but on small amounts. Continue with the same process until all hair is done. 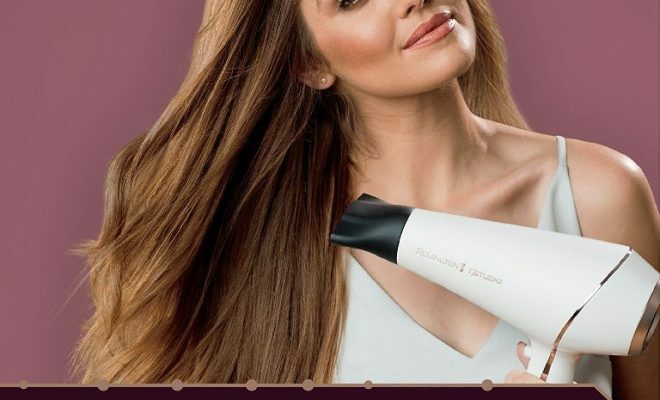 Message the product using your fingers gently round your hair. First apply big toothed comb to push hair straight towards the back of neck. Apply small bristled comb to make your hair finally. You can as well apply curling tool on less heat when to roll bangs at front. Push hair on the left at back of ears and fix pin at the end. then finally using your fingers pull small volumes of hair and apply hair product to make it smooth then place it back as wave then inter lock hair with each other and fix black pins. Increase the size of waves as you go towards bottom and fix pins too to hold hair in place. Add hairspray to keep hair looking fresh and last fix tiara at mid crown. Hopefully you can entirely fill your hair with medium length straight weave which blends both on black color with few brown highlights on top. So you will you divide hair into two sections, the lower section is pushed straight for hair on the right pushes with bangs then hair in the left combed straight and finished at back of neck. Likewise for hair on the right tips are pushed too towards the back of neck and put together. For each side you roll the ends and face hair upwards. So hair in the middle is pushed with high bun waves crossing each other then you fix pins to hold it. Determine your face Shape: the bride up front wearing flattering wedding short hair on straight bangs and high bun is oval face shapes. She has sharp chin and long jaws. However if you pick interest you for this hairstyle yet it doesn’t match with the one on the pictorial, don’t get nervous because it looks stunning to all face shapes. Which Hair product to apply? On scalp add tee tree conditioner to prevent dandruff and the same time providing your hair with moisture then o top add detangling spray to make hair manageable. Lock in sheen and for strong hold and this is spray is Bobos Remi Wig & Weave Detangle Spray. Which styling tools apply? Of course your natural hair is added with cornrows using weaving threads. As you make cornrows toward the front left where hair parts on sides you kind of make then go across that’s you start it at front then draw it straight going inward. so when fixing it on top it automatically goes with ease. Have in place medium length weave both on black color blended with brown highlights. To after fixing weave on top push hair straight as you check on the lower section of hair then in the middle pull high bun with waves and fix with in hair pins to make hair firm. Lastly finish by applying hairspray on to your hair to keep it looking healthy. There’s hairstyle that you been missing out, given a chance to choose a flattering style that keeps you on trend. Rihanna is one of international celebrities that have stood tastes on most sounding fields like hair and dressing. You might know her another reason that I have skipped out that never the less she inspires every black woman out there so we look out for her set phase for us. 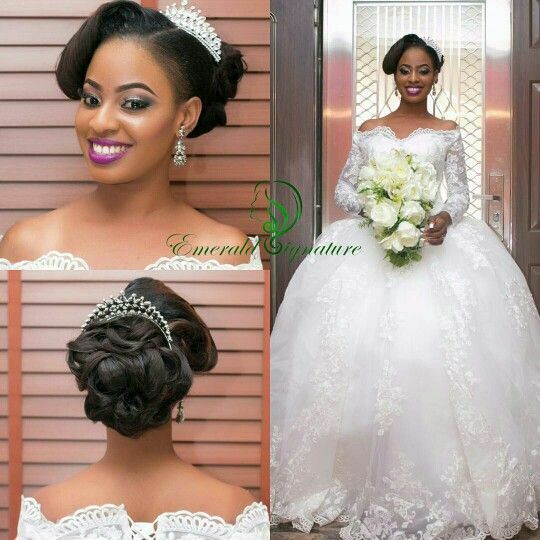 She is wearing flattering hairstyle which any black bride can wear and look awesome on her wedding. And elsewhere for other purposes this hairstyle can work. That’s why you see her at the moment on her free time wearing it to keep on trend. If you have medium length natural hair or relaxed hair this hairstyle is possible and like make heads round you turn for compliments. Hair on the right hand side is pushed towards the back of neck straight and hair on the left too is pushed towards the back and put together. It’s added with pin at lower back of neck. So hair on top is pushed with volume and stretched at front looking backwards. Tips are then pushed backwards and bun is secured .since all hair is pushed off your face you only left with one option, which is to shape your eye brow and shade it either light or bold. Add makeup, jewelry and best sheen of your lips to keep you tuned. Thus any bride can wear this celebrity short hair with bangs and for sure keep your audience steady. Determine your face Shape: Flattering wedding celebrity short hair with bangs is worn on an oval face shape. What else i need to add on this point is that is looks great on any other black woman’s face shape no matter the nature of your skin tone. Take the initiative that try it on either for leisure of important meetings like parties, engagements, so on and so forth. Which Hair product to apply? Add TCB HAIR & SCALP CONDITIONER WITH OLIVE OIL 10 OZ, for even moisture distribution round the scalp and entire hair. Since hair is evenly moisturized there minimal chances of hair breaking. However it makes hair soft thus easy to make and keeps it looks healthy. Which styling tools apply? If you have any growth round your hair before wedding, you will have to relax it so that hair looks neat. After hair is done with washing and adding conditioners you then wash the product off too. You leave few waters on your hair then add small quantities of setting lotion and add rollers on to your hair. Dry hair under drier and after put off rollers from your head and add hair product on scalp and few volumes on top of hair. Use big comb with big bristles to push hair towards back. Apply small bristled comb to style hair and apply hair pins at the back of neck to hold the lower part of hair. Finally add hair spray for strong hold and lock in shinny look. You can be that bride who falls for hair with gel, and want to wear it on your wedding on short hair. Am telling you it’s applicable, check how the bride in the pictorial added gel on to hair which I guess is relaxed. When you apply gel hair tends to stick on the scalp, at a point where all hair collects you kind of draw single box up to last tip of hair. You then fold it back at bottom going round then you make it firm using weaving threads and needle. As you add gel on to your hair you push few hairs at front towards forehead and apply gel on to it as you curve it forward on both sides then set your hair to dry. On top you fix short hair piece that finally form a cute bun. You will find this hairstyle convenient, looking great and of light weight. Determine your face Shape: the babe featuring flattering wedding short hair with micro bangs along with bun on oval face shape. 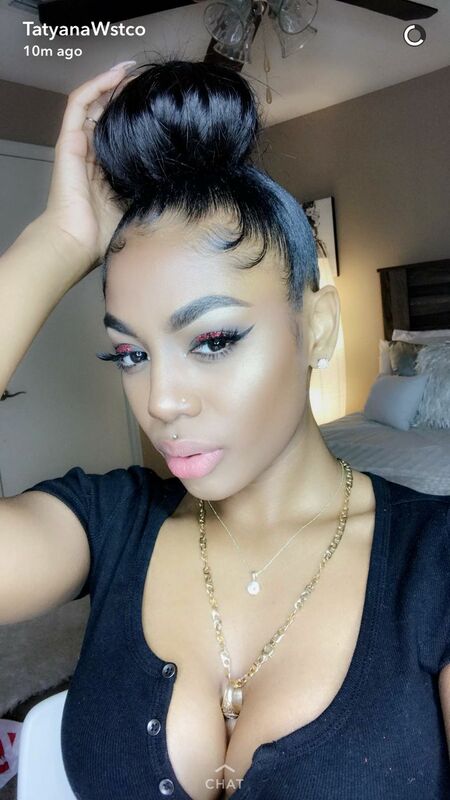 What I can say about this hairstyle is that is blends perfect with all face shapes of black women or brides no matter the color of your skin complexion. Which Hair product to apply? When you add gel on to your hair automatically hair becomes stiff and there’s no way you can add hair product. Rather for the hair piece that you fixed on top of hair will need hairspray to keep it charming. Which styling tools apply? On clean relaxed hair, you apply small bristled comb to push hair from all sides to mid crown. You put all hair together in to one box starting at bottom up to last tip. Apply gel on to hair starting at bottom coming upwards towards the crown. Using the tail comb push some hairs at front towards forehead then add gel on to it as you curve it looking forward. Wait for some second until hair becomes stiff. In place you already have short hair piece to apply on top that looks exactly your natural hair. Use weaving needle and threads to fix it firm and make sure you fix it facing down then apply another stretch of weaving through the bun to make it tight. Finally add hairspray to keep hair looking original.